My wedding is coming up in a few short months and I am currently trying to drop a few pounds before the big day. My plan is to eat fewer carbohydrates and more vegetables. Most of the time though I still crave comfort foods! I came up with this next recipe to satisfy my cravings and my attempt to be a little healthier. 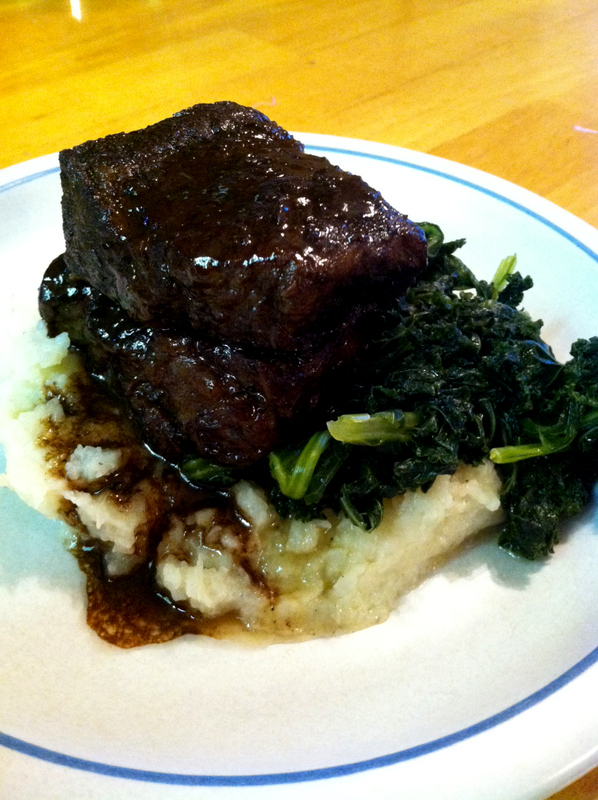 Red Wine Braised Short Ribs cook for 3 ½ hours at a low temperature until they are almost falling apart. The shortribs are served with mashed cauliflower, sautéed kale and a beautiful pan sauce. It might take a little more time than a normal weeknight meal, but it’s worth it! This wonderful recipe also happens to be the PERFECT Father’s Day meal! 2. Heat a large saucepan over high heat. Season both sides of your shortribs with salt and pepper. When your pan is hot, add 1 tablespoon oil and swirl to cover entire pan. Sear shortribs until caramelized on all sides. When done, remove from pan and place in deep baking dish. 3. Lower heat to medium, add 1 tablespoon oil, then carrot, onion, celery and a pinch of salt. Cook for about 5 minutes, or until fragrant and caramelized. 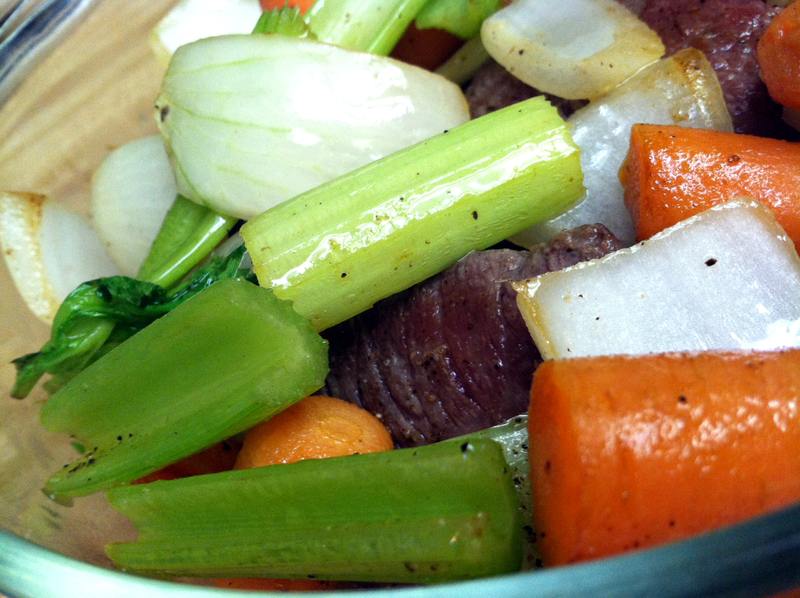 Place vegetables in baking dish with beef and return pan to heat. 4. Deglaze the pan with red wine, working to scrape up any bits of meat or vegetable stuck to the pan. Cook over medium heat for 10 minutes, then pour over meat. 6. Cover dish with aluminum foil and bake for 3 ½ hours. 7. When finished, remove meat from baking dish and set aside. Strain vegetables from cooking liquid. Discard vegetables and return cooking liquid to a medium sauté pan. 8. Over medium heat, simmer liquid until it has reduced by ¾. It should be thick enough to coat a spoon. Check seasoning, add salt or pepper, if needed. 9. When you are ready to serve the shortribs, return them to the pan to re-heat and glaze. 10. Add 1 tablespoon of cold butter to the sauce. While gently tilting the back of the pan toward you, leave the base of the pan on the heat. Quickly spoon the sauce, that has puddled at the base of the pan, over the meat. This will emulsify the butter into the sauce, making it glossy and smooth while also glazing the meat. 1. Bring a large pot of water to a boil. Add cauliflower and cook for 8 minutes or until very tender. 2. Drain cauliflower and return to pot. Add butter, salt and pepper. Mash to desired consistency. You can also puree the cauliflower for a creamier consistency. 1. Start by washing the kale and then remove the greens from the stalks. 2. In a medium pot, heat 1 teaspoon oil over medium heat. Add garlic and sauté until fragrant. 3. Add kale and chicken stock. Cook, stirring frequently for about 30 minutes. 4. Add more water to the pot if all liquid evaporates. When tender and cooked through, add salt and pepper to taste. What’s your favorite meal to cook for Father’s Day?